The Studios of Key West is at 533 Eaton St. Gallery hours are Tuesday-Saturday, 10 a.m. to 4 p.m. For more information, go to www.tskw.org. 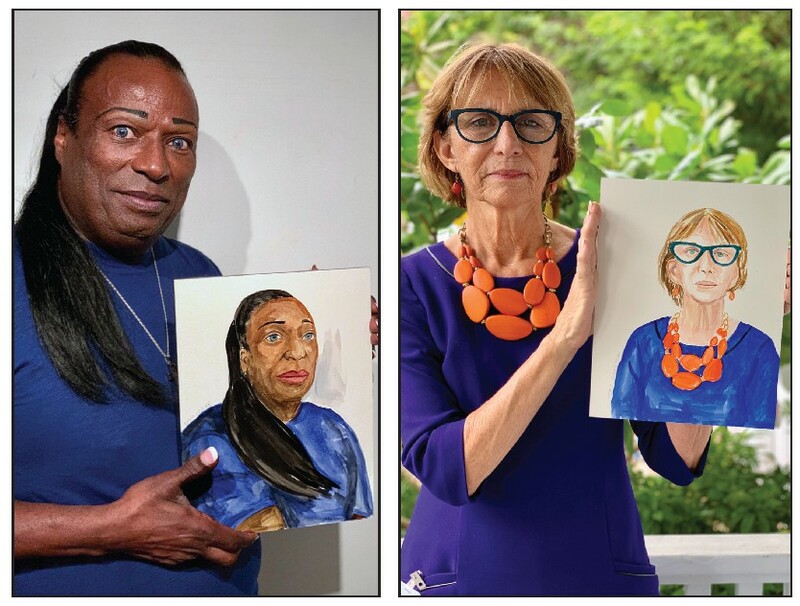 ¦ Among the 101 Key Westers who posed for portraits by Brenda Zlamany were Vogue, left, and Mayor Teri Johnston, right. Four new exhibitions opened at The Studios of Key West during the First Thursday event on April 4. There are portraits of Key West community members painted by Artist-in-Residence Brenda Zlamany. There’s the Lemonade Stand Gallery’s ever-popular Small Works Show. And there are mixedmedia work by Lisa Esposito and palm tree sculptures by Kerry Hoeppner. Everything remains on display through April 25. In February, Zlamany invited 101 Key Westers to pose for watercolor portraits as part of her ongoing “The Itinerant Portraitist” series, in which she travels the globe to explore the positive effects of painted portraiture. Previous chapters have included the Aboriginal population from Taiwan, girls from an orphanage in the United Arab Emirates, taxicab drivers in Cuba, artists in Brooklyn and elderly and disabled people in a nursing home in the Bronx. Zlamany uses the camera lucida, a device for drawing that dates back to the Renaissance and that promotes a two-way exchange between artist and subject. Aiming to capture a cross-section of the community, she painted Key West drag queens, teachers, fishermen, MARC House residents, artists and even Mayor Teri Johnston. All 101 portraits are on display in the XOJ Gallery. 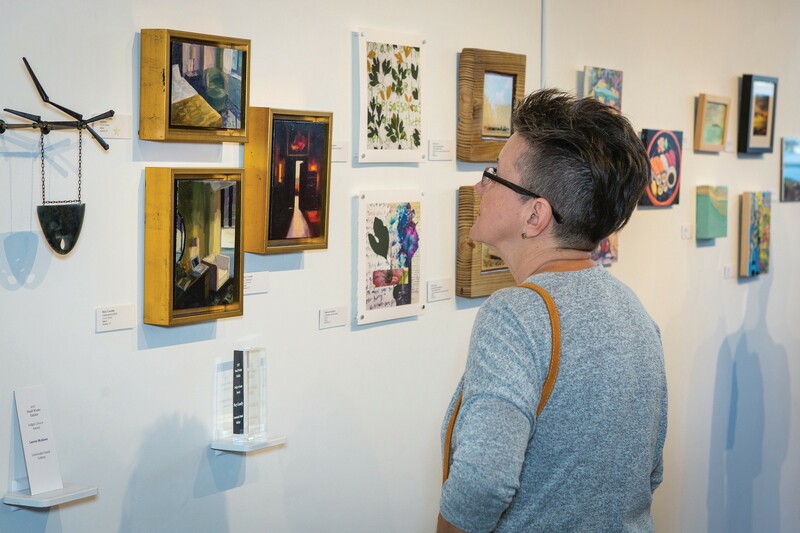 MaryBeth McCulloch admires works at last year’s Small Works Show. The Small Works Show, curated by Lemonade Stand Gallery, takes over the Sanger Gallery with more than 170 works from artists across the U.S. and around the world. Nothing exceeds 10 inches in any direction. This year’s entries include sculptures, paintings, drawings, photographs and hand-made books, at a wide range of price points. 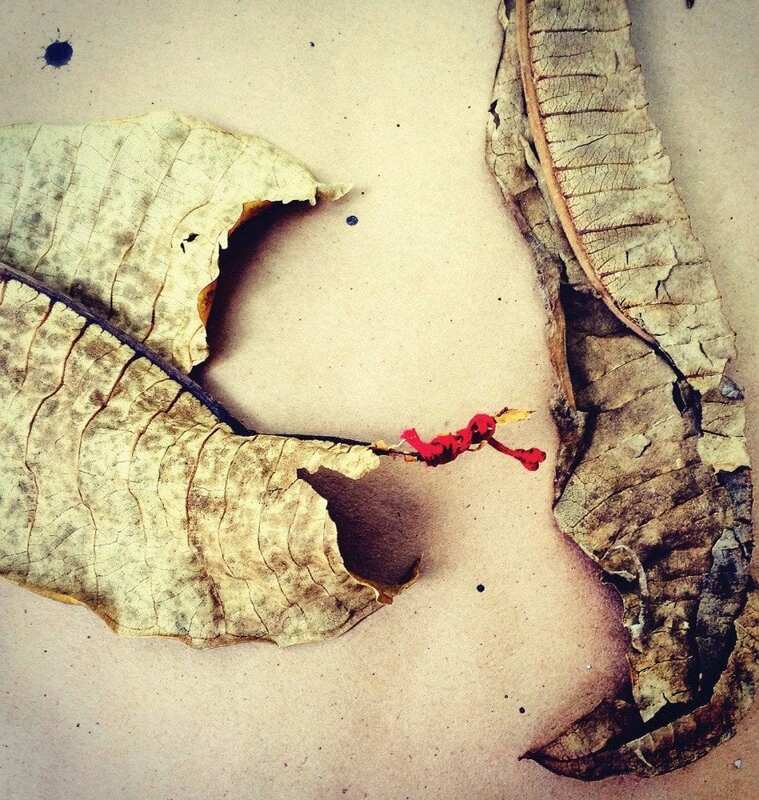 Showing in the Zabar Project Gallery is “10,000 Memories Deep,” a series of mixed media images by Lisa Esposito. Like dreams, Esposito’s images are fragmented yet connected, familiar yet uncertain; past meets present, form and color traverse time, and personal narratives prevail. Kerry Hoeppner’s “Art of the Palm” is in the Zabar Lobby Gallery. 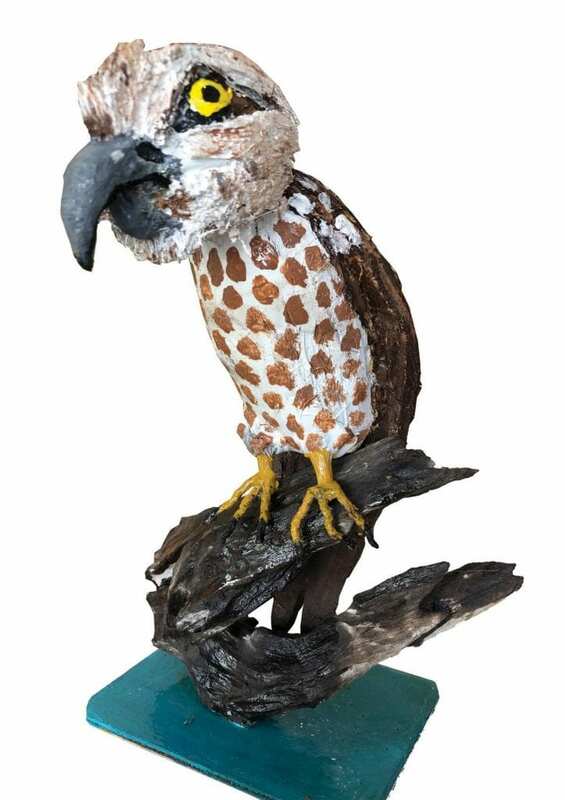 Known for his ability to turn palm fronds, coconuts and other natural bits into whimsical sculptural creations, his recent collection includes birds, bumblebees and even a bust of Einstein.